Rigid Flex circuits (rigid-flex circuit boards) are boards that are made of Rigid circuits ( FR4 PCB) and Flex circuits & circuitries. The Rigid circuits ( FR4 PCB) are connected with single or multiple flex through PTH (VIA) , inside or outside of Flex circuit layer, so it enjoys the advantage of both Rigid FR4 PCB and Flex circuit. 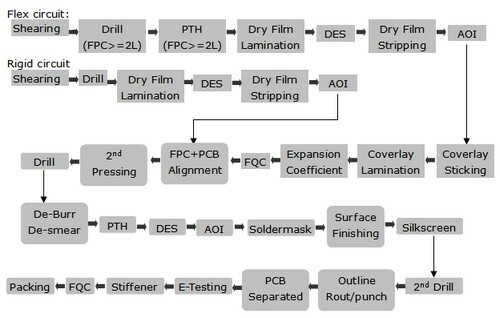 Rigid-flex PCB is differentiated from multi-layer circuits with stifferners by having conductor on the rigid layers. Plated through holes (PTH) extend through both rigid and flexible layers. BEST CO., LTD. provide various sizes of Rigid-Flex Circuit boards, of different layers. All Rigid-Flex Circuits are tested with flying-probe testing machine reflecting all Gerber data to insure continuity and other data requirements. We can provide fast prototype, on time delivery, great quality for you. We can also do SMT/SMD as per client request. Please contact us today for more information about rigid flex circuits.